The Google Nexus 5 is said to have much in common with the LG G2. But this 5-inch gadget made by Google and LG still deserves our applause regarding to its sharp 1080p touch screen, fast Snapdragon 800 processor, the latest Android 4.4 KitKat, competent battery, etc, all making it sense watch movies on the smartphone. To help you maximize the use of it for new DVD movies, this article shows you how to rip DVD to Google Nexus 5 compatible format for playback at one go even it is devoid of DVD drive. Tips: The task can be accomplished with Handbrake. You can following the Handbrake tutorial to rip DVD and do some mazy parameter settings for the new device. 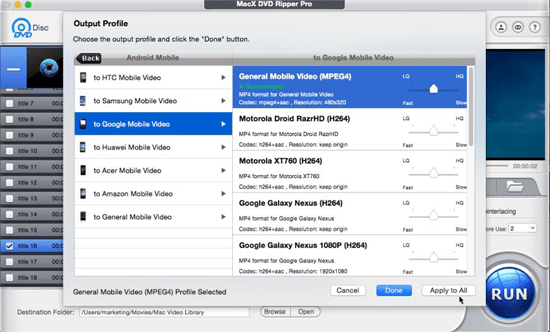 But for Sony or Disney DVDs with protection schemes, you'd better turn for a professional DVD ripper like MacX DVD Ripper Pro that can both disable copy protection measures from discs including the latest DVD movies like Star Wars 7, Hunger Games 4 and more, but also rip DVD into a format playable on Nexus 5/7/4/9/10 directly. Follow the steps below to know how to convert and import DVD directly. Free download the top DVD ripper and rip DVD to Google Nexus, or Apple iPhone SE/6s/Plus, iPad Mini 4, new iPad Pro/iPad Air 2, Galaxy S7/S6/Edge, SP 4 etc. mobile phones tablets. Prior to the DVD conversion, you need to download this DVD ripper on your Mac (El Capitan incl.) or download Windows version for PC. Tips: MacX DVD Ripper Pro is only available for Mac users to rip DVD. For PC users, you can head over to the windows version of DVD ripper. Run this DVD ripper for Mac and insert the disc to the DVD drive, click "DVD Disc" button to import the movie. If you have already saved the DVD as DVD folder on your computer, simply click "DVD Folder" to load DVD folder. From the pop-up small window, you can choose "Android Mobile" > "to Google Mobile Video" > "Google Galaxy Nexus" as the output video format. And then click the "Done" to return to the main interface. With the above steps been finished, click the "RUN" button to start DVD conversion on Mac computer. Then you can connect your Nexus 5 with computer and transfer the converted movie to your smartphone for playback in the most vivid way. BTW, if you wanna watch the converted DVD video on iPhone iPad iPod, you can take advantage of MacX MediaTrans to easily move video from computer to iDevices for free enjoyment. 1. Rip DVD to play on more devices: This DVD ripper keeps up with the latest trend around mobility and constantly updates to support the newest gadget and operating system. So you can easily DVD to Huawei Mate 10 (Pro), convert DVD to Droid RAZR HD, rip DVD to iPhone 5S/SE/6S/6S Plus/7/7 Plus, iPad Air, Google Nexus 4/7/9/10, Samsung Galaxy S7/Edge, HTC One, and other new phones and tablets in a snap. 2. Edit movie for your gadget: You can convert only a part of DVD movie to your Nexus 5 by trimming, watch the movie on your device in your preferred aspect ratio like 16:9, 4:3 or else by cropping or add external .srt subtitle to the movie to make it understandable. This tutorial shows you how to rip DVD to Huawei Ascend D1 compatible video format, regardless of copy protections encrypted on DVD with the help of DVD to Huawei Ascend D1 converter. Notice: We only advocate using this best DVD ripper to rip commercial DVDs to Google Nexus 4/5/7/9/10 under the concept of Fair Use and do not encourage any illegal reproduction or distribution of copyrighted content. Please abide by the local DVD copyright law before doing it.